Right now you can get this L.O.L. Surprise Under Wraps Doll- Series Eye Spy is currently available for $11.88. As you may know L.O.L. Dolls are a huge hit during the entire year so I would get this one before it disappears. -L.O.L. 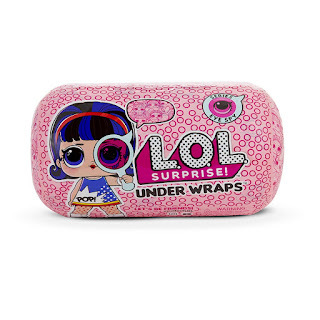 Surprise eye spy under wraps includes 15 surprises! (1) spy glass (2) secret message sticker (3) surprise codes, (4) bottle, (5-11) mystery disguise, (12) shoes, (13) fashion accessory, (14) outfit, and (15) lol surprise eye spy under wraps doll. -Find surprise clues with the lol surprise eye spy series spy glass. -Feed or bathe your lol surprise doll to discover water surprises! -Capsule becomes a purse carrying case and doll stand. Shipping is free. Prices can change at anytime.